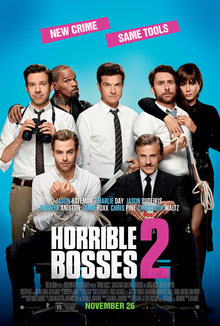 Another comedy sequel, and although I quite enjoyed the first film, the format of ‘Horrible Bosses‘ didn’t really lend itself to more of the same. With that being said, this was an enjoyable watch, though not quite as funny as the 2011 effort. The story picks up after the events of the first film with the same trio, Kurt, Nick and Dale (Jason Sudeikis, Jason Bateman and Charlie Day, in that order), who have now quit their jobs and are attempting to launch their own business producing multi purpose shower heads known as the ‘Shower Buddy‘. After a disastrous appearance on a daytime TV show (which is amongst the funniest bits in the film), it seems their luck is in when a rich investor and his son (Christoph Waltz and Chris Pine) show an interest and place a large order. As you would expect, things don’t go as smoothly as they hope. Waltz and Pine are good additions to the cast, albeit we don’t get as much Christoph Waltz as one would hope for, and a couple of small appearances from the ‘bosses’ from the first film, Kevin Spacey and Jennifer Aniston in particular are great fun. The central trio are funny and bounce off each other well, albeit Charlie Day verges very closely on becoming a little too shrieky and annoying (and I say this as someone who loves him in ‘It’s Always Sunny in Philadelphia‘). In terms of the script, it’s similar in concept to the first film with the central characters devising a ridiculous plan to get one over their bosses (or investor in this case), although there’s a neat twist in here that keeps things fresh. If you enjoyed the first film, you’ll get a lot of laughs out of this, and as far as comedy sequels go it’s been one of the better ones of late, which I accept is a pretty low bar!